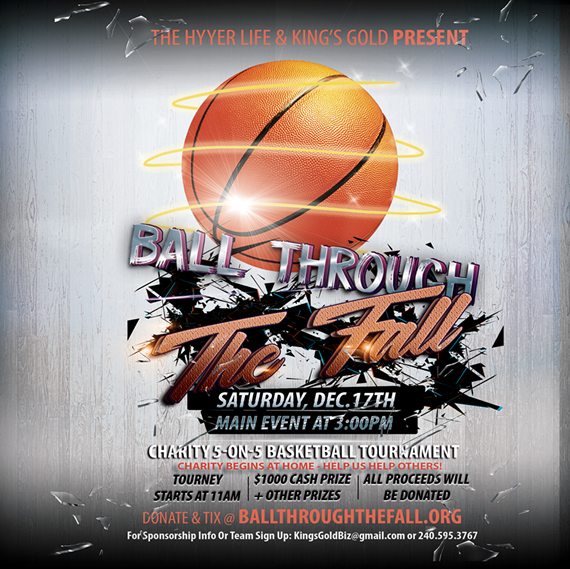 Washington, D.C—December 8, 2016 – On Saturday December 17th, 2016, at 3:00 PM, King’s Gold and The Hyyer Life, LLC will be partnering up to bring the public “Ball Through The Fall,” their second annual charity basketball tournament used as a fundraiser and a platform to bring awareness to the homeless epidemic sweeping the DC, Maryland, and Virginia areas. the DMV area. Central Union Mission, Bread For The City, and Capital Area Food Bank will be the 3 benefactors for this year’s event. What makes this even more special is that this event has been coordinated fully by young millennial individuals who want to give back to the community. Everyone involved in putting everything together is 25 and under and are looking to better the community. Those involved are looking to gain the support of the community and help make this Thanksgiving season a positive one for all. King’s Gold and The Hyyer Life aim to raise $10,000 to assist in the fight against the homeless epidemic while also raising awareness in the millennial generation. There will be numerous surprise guests, vendors (including a food truck), and quality competition. This event is something for all ages (though 18+ is encouraged) and is sure to leave a lasting impression and create a feel good atmosphere. To purchase a ticket, donate to our online campaign, and/or learn more about the event, visit BallThroughTheFall.org. Can’t make the event but still want to donate? Be sure to go to GoFundMe.com/CharityBeginsAtHome to help someone in need today! The Hyyer Life, LLC is a millennial culture-curating lifestyle brand that was started in 2014. It’s aspiring mission is to challenge each person that comes into contact with the brand to go ‘above & beyond’ in every aspect of life that they consider significant. The brand has become an ever-growing staple amongst the youth in the DMV area, deriving its first pair of legs primarily out of the University of Maryland. Since it’s inception, it has now spread vastly from the DMV area to many other states. The brand’s main means of expression is street-wear apparel and lifestyle products and events for the everyday millennial. For more info on The Hyyer Life, please contact TheHyyerLife@gmail.com. King’s Gold is a locally based lifestyle and apparel brand that creates high-end street-wear. The brand also focuses on philanthropic endeavors to help enrich the community and bring out the royalty in all of us. For more info on King’s Gold, please contact KingsGoldBiz@gmail.com. community engagement, at Cell: 202-534-9965, or visit www.missiondc.org.